The Constitutional Amendments Publication Commission met Thursday to finalize language describing proposed constitutional amendments. 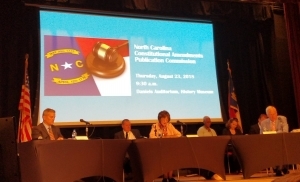 The North CarolinaConstitutional Amendments Publication Commission held an emergency session Thursday, the last day available to finalize language describing proposed amendments for voter guides. The commission consists of three members: Secretary of State Elaine Marshall, Attorney General Josh Stein, both Democrats, and Legislative Services Officer Paul Coble, representing the General Assembly. Their goal: craft descriptions will be distributed through the county-level elections offices and through voter guides mailed to more than four million North Carolina voters. The commission would have also crafted short captions for each amendment appearing on the ballot this fall, but the GOP-controlled General Assembly seized that authority just earlier this month during an ongoing power struggle with Gov. Roy Cooper and other North Carolina Democrats. Legislators are being called back to Raleigh for another special session Friday after a three judge panel ruled their ballot language was not a fair representation of the amendments. Five separate lawsuits over the proposed amendments have to be resolved before the ballots can go before voters. Earlier this month, the commission met and approved language for the proposed amendments on crime victim protections (HB 551) and hunting and fishing (SB 677). On Thursday the commission took up language for the proposed amendments on voter ID (HB 1092) and capping the state income tax rate (SB 75). The two amendments blocked by the three judge panel were not considered by the commission. Final explanations of the four amendments got final approval Thursday, though Coble repeatedly took issue with language Marshall and Stein suggested. The lines at issue pointed to what the amendments do not tell voters – chiefly, how much implementation might cost and how it would be carried out. Coble declined to speak with reporters Thursday, as he did after the commission’s last meeting.